Calligraphic representation of the name of Abu Bakr. Born to a wealthy family, Abu Bakr was a successful merchant with a reputation for honesty and kindness. Tradition has it that, having long been a friend to Muhammad, Abu Bakr immediately accepted him as a prophet and became the first adult male to convert to Islam. Muhammad married Abu Bakr's daughter Aishah and chose him to accompany him to Medina. Shortly before his death, Muhammad asked Abu Bakr to offer up a prayer for the people. This was taken as a sign that the Prophet had chosen Abu Bakr to succeed him. 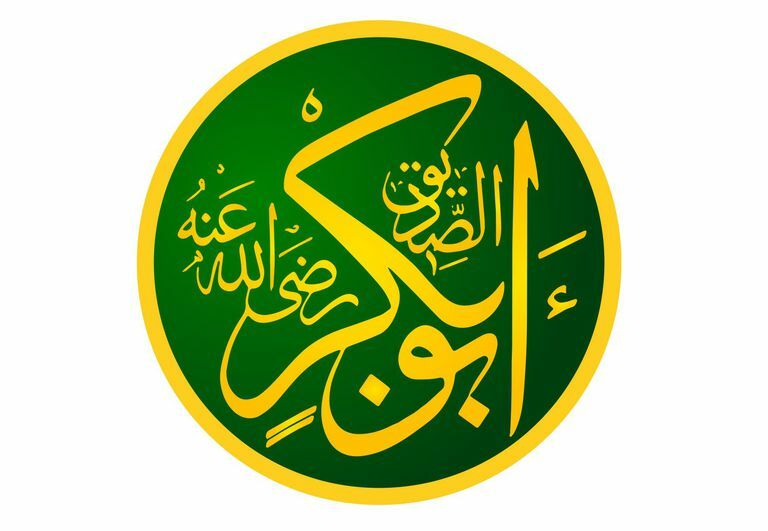 After Muhammad's death, Abu Bakr was accepted as the first "deputy of the Prophet of God," or caliph. Another faction preferred Muhammad's son-in-law Ali as caliph, but Ali eventually submitted, and Abu Bakr took over governance of all Muslim Arabs. As Caliph, Abu Bakr brought all of central Arabia under Muslim control and was successful in spreading Islam further through conquest. He also saw to it that the Prophet's sayings were preserved in written form. The collection of sayings would be compiled into the Quran (or Q'uran or Koran). Abu Bakr died in his sixties, possibly from poison but just as likely from natural causes. Before his death he named a successor, establishing a tradition of government by chosen successors. Several generations later, after rivalries led to murder and war, Islam would be split into two factions: the Sunni, who followed the Caliphs, and the Shi'ite, who believed that Ali was the proper heir of Muhammad and would only follow leaders descended from him. Abu Bakr was the closest friend and companion of Muhammad and the first Muslim caliph. He was one of the first men to convert to Islam and was chosen by the Prophet as his companion on the Hijrah to Medina. "Our abode in this world is transitory, our life therein is but a loan, our breaths are numbered and our indolence is manifest."